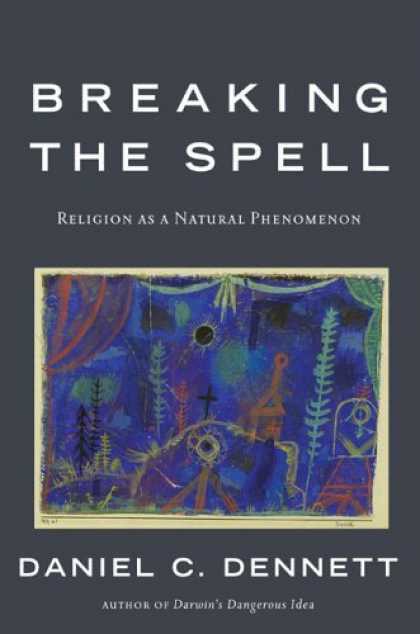 I am reading Daniel C. Dennett's Breaking the Spell: Religion as a Natural Phenomenon. This recent paper of his regarding clergy captured my interest. I consider myself a religious person. I also think the creeds are fiction and that human beings have created the concept of "God." Whatever "God" might have been in the past is really us in the present. As such the "holy" or the "sacred" is here and now and in between and betwixt us. The language and lavish praise we have foisted upon an imaginary deity is really best suited for Earth and all of its magnificence. However, I like the institution of the church. I like "organized religion." I do well at it and I think it can be a positive force for good in the world. I like my job and plan to keep it. Thank you very much. But I don't believe any of its founding myths are "real." Nevertheless I enjoy telling the stories, singing the tunes, potlucking, and doing justice in my community. I appreciate music, stories, myths, people, the heritage, and the spats. Religion, especially in America, is influential, powerful, wealthy, and dangerous. I think we counter bad religion with good religion not with no religion. For the record, I appreciate the four faces of the "new" atheism: Dawkins, Hitchens, Harris, and Dennett. I think it will be good for religion that they have written their books and I think every religious person should read them. Tentatively, I propose to define religions as social systems whose participants avow belief in a supernatural agent or agents whose approval is to be sought. p. 9. This is, of course, a circuitous way of articulating the idea that a religion without God or gods is like a vertebrate without a backbone. p. 9. A commenter (Jodie) once chided me (in a good spirit, I add gladly) that Christianity without God is like coffee without caffeine. What's the point? I think there is a point. I think there are a number of good reasons to have religion without supernatural theism. I get asked about once a week usually in an accusing tone why I should be involved in religion or be a minister when I don't believe that some fanciful tale is true. I offer a long explanation of why the social institution is valuable and can be even more valuable if it were to analyze itself critically and direct its energies toward the well being of Earth. That unfortunately, is usually met with silence followed by another question: "Why don't you quit the ministry if you don't believe in God?" Good grief. It isn't about "God." It is about doing good. But if the concept of "God" is important for you in order to do good, then great. It is not that big of a deal. I will pony up and use it with you. Too much religion is like too much coffee - things start to spin around in ways I just don't like, and I end up with an upset stomach and a nervous tic. I drink decaf coffee because I like the frickin' taste of the stuff, not because it props me up. Sorry, Jodie. Places like First Pres allow me to enjoy the flavor of religion without getting the jitters. The definition of religion is a key point. Besides the UU would 'religion' also include groups like Ethical Culture and several other groups associated with the International Humanist and Ethical Union. Aside from UUs, I don't think that Dennett's definition would apply to most Buddhists either. One of the problems that I have with a lot of the New Atheists (and a lot of Old ones as well) is that they seem to define "religion" in very narrow terms that have a lot to do with orthodox Christianity and very little to do with the broad spectrum of religious belief that lie outside of that particular form of religion. Example: Susan Jacoby, an atheist writer, said in her column in the On Faith web site that "Today, as in the past, atheists can say only that on the basis of the available evidence, we don't think an omnipotent deity has anything to do with either the ultimate origins of the universe or the ethical dilemmas that human beings confront every day." And yet there are lots of religious people who would say exactly the same thing. I'm not sure who is to blame for this, but I suppose that if you live in a culture where orthodox Christianity is so predominant, it is easy to make generalizations about all of religion based on what the dominant religion says. So far, I am enjoying Dennett's book. Only into it about 80 pages but it seems his task is to study religion scientifically as we would anything. Why do we have religion? What does it do? How has it evolved in certain ways? Why is there a taboo regarding exposing it to study? I can see why people have a hard time defining religion. I wonder if rejecting every definition of religion that someone comes up with (as I have done here) is a defense mechanism that helps the institution survive. That pretending to be "mysterious" or unreachable by scientific study helps it to survive? What is the advantage to religion for its clergy to have a secret society in which it is taboo to talk openly about the truth of its dogmas? How does that secrecy keep the institution going? Or does it? I find the writings of John Shelby spong to be very worthwhile in my "search" - His latest "Eternal Life - A New Vision is very powerful. I think you and he would agree on a lot of things. I think Spong is fantastic. He has helped many people shake off toxic religion. I even named my Westy Terrier, "Shelby" for him! You can always go back to the original meaning, which is re-ligio -- or "re-align" with the sacred. What is sacred? What is Holy? Those are the things that science cannot define. Another term to consider is "re-enchantment." There was a time when the world was enchanted with spirit. We need to get back to that, or open ourselves to that dimension, in order to "re-align" ourselves with the planet's natural balance, with the order of the Universe, as we now know it. "Belief" as the sole definition of "religion" is too restricted. If I thought I could get away with it, I'd put "Priestess of the Cosmos" on my business cards . . . The sacred, holy, that we have given to "god" belongs on Earth and among all of us earthlings (two-leggeds, four-leggeds, multi-leggeds, winged, rooted, finned, etc.). Religion (religio-bind as you say--yes!) is that what binds us to Earth and says this is holy and sacred. So...not only do I think the myth of the sky god who dons a birthday suit, dies to save us from sin and flies back to heaven not literal, it isn't even very good myth. We can respect it for what it has done, salvage parts of it, but it needs an overhaul. At least that is my opinion. And yet there are lots of religious people who would say exactly the same thing. I tend to agree with you but I don't know for sure. We (and I mean clergy) are so closeted, guarded, and used to using spin and double-talk that it is hard to know. Dennett points this out in his profile of the five clergy who I think are the kinds of people you are talking about. I have sympathy for the atheists who have to be frustrated with the slippery and illogical language of progressive Christians. I know I use spin in trying to find ways to salvage the mythology or the concept of "God." We say, "I don't believe in the god they [atheists] don't believe in either." We dismiss their definitions of religion and God. But really, for the vast majority of Christians, their definition applies. The question is put to us progressives. What does "God" mean if it doesn't mean what we say it doesn't mean. I am beginning to think that it doesn't mean much. I joked with a friend that the difference between pantheism and atheism is the same except that pantheism sounds more spiritual. I know you embrace panentheism and process theology. But frankly, that stuff is over my head. Whatever "God" we come up with is certainly not the God of the Bible or of the creeds. No intervention, no miracles, no personality, no being. Any story that contains the character "god" is fiction. We don't need a guiding force, because evolution is unguided. I am not sure what even the most sophisticated "god" could even do. We can say "God" is poetry, metaphor, a term for "Mystery", or as Gordon Kaufmann says "creativity" but really that is light years from the god of Christian mythology. I certainly am not going to leave it to fundamentalists or to atheists to tell my how to define my terms and live my life, but I think we are being challenged to come clean as religious people. I wonder if it is time for religious folks to stop defending the concept of "God" altogether and take our leave of God and focus our religious energies on life. I wasn't just referring to progressive Christians as a counterexample to Susan Jacoby's comment. Is Buddhism a religion? Or, to cite your example, what about UUs? Is it necessary to produce a tidy definition of religion? Religion encompasses a lot of different kinds of belief systems, and for some religion isn't about creeds at all. Orthodoxy Christianity isn't the center of the universe, and when you consider broad range of religions and religious beliefs that exist, it becomes clear that many of the categories of thought that define Christian religious belief are not what characterize religion per se. You're right. It just got me thinking about other things. Now that I am reading further in his book, I guess you need some kind of working definition for religion to account for it from an evolutionary perspective which is Dennett's plan. I don't know how Buddhism, UU, and others who don't have supernatural beliefs will fit into that. @Mystical I think you are correct. To define the word "religion" as representing a wide varieties of views as if they are all the same is a failure to do "religions" justice. If there can be what is essentially an atheistic Buddhism as over against Islam, Hinduism, Animisim, Confuscianism, then religion is used as too broad a term. Atheism has to combat each religion and persons who find and adherence to a variety of religions must also face the fact that there are a variety of atheisms. @John I think that if one is going to disagree with another's point of view that one needs to encounter what the other has to say about him/her self. I realize that many religious people, particularly in the West see the terms "natural" and "supernatural" as adequate to describe particular acts of the divine I think these are relatively new terms birthed by Modernism (although I would agree that one can find their origins in Aristotelian thought). Following a more Dutch Calvinist tradition I don't think such a dichotomy to be an adequate description of God. God is involved in all. One cannot split the works of God into natural and super natural unless one seeks to define one's religion along the lines of those who seek to determine what religion is from their point of view. There rather the acts of God that we see as more frequent and those acts that are less frequent. To make a separation between natural and unnatural is to take a semideist position, suggesting that most of the time God is the watchmaker who made the universe and lets it go on it's own but then intrudes in nature occasionally to act against the way God normally act. From a Christian (or maybe Dutch Calinist) viewpoint this fails to describe God's action in the universe my accepting Modernist terms to describe how the religious think. An example: When a particular star goes Nova this, while it looks like a natural act is actually God acting. Similarly when someone has terminal cancer and the cancer goes away that too is God acting. Since my last comment I have read further in Dennett's book. One of the things that has helped religion to survive is that it has developed many strategies for not allowing itself to be defined (which allows it to be free from critical evaluation). For example, "God" becomes very slippery, meaning nearly anything. The postulation of invisible, undetectable effects that (unlike atoms and germs) are systematically immune to confirmation or disconfirmation is so common in religions that such effects are sometimes taken as definitive. No religion lacks them, anything that them is not really a religion, however much it is like religion in other regards. I think this would probably remove UUs from Dennett's religion list and perhaps some progressive Christians. I don't know enough about Buddhists (I understand the vast majority are like Christians who believe in divine beings and in other things that cannot be disproven). The italicized was a quote from Dennett, p. 164. IN 2004 BBC produced "The Athesim Tapes" in which Jonathan Miller interviewed several scholars, including Daniel Dennett. In the interview with Colin McGinn (viewable here: http://video.google.com/videoplay?docid=-7853929164413117774#) the topic turns to the value of church and religion, with the notion that both can be helpful to accomplish good. (we know all too well that the institutions and institutionalized belief can be harmful). Still, the tape is worth the 27 minutes it takes to view it, if you're interested in the topic. 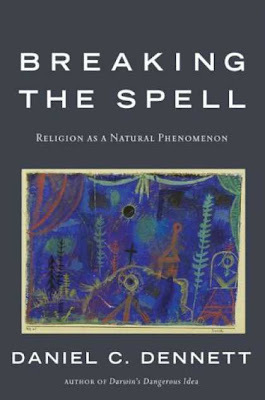 The postulation of invisible, undetectable effects that (unlike atoms and germs) are systematically immune to confirmation or disconfirmation is so common in religions that such effects are sometimes taken as definitive. No religion lacks them, anything that lacks them is not really a religion, however much it is like religion in other regards. I am enjoying the video links. Without having seen the video, I would still like to offer my response to the question of religion's value. I think that religion will only ultimately be valuable (or at least neutral) when it allows itself to be evaluated critically. Its superstitions are not simply benign and cute. These superstitions lead to destructive behavior not only in regards to knowledge (ie. creationism) but in behavior towards others (ie. gays). I think it is important for people within the religions to evaluate their own beliefs. "A system of beliefs held to with ardor." Dry, yes, but to the point. I wonder then, what "beliefs" are. Are they statements of value? Regardless of how we define religion (whether it includes assertions that cannot be disconfirmed or not), the larger question is what is to become of the church when it lets go of those assertions? That is where I think congregations need to go. No special pleading. The one problem I see with Webster's definition is that it includes a great many things that would not normally be considered religion. Atheism would fit the list. So would communism, capitalism, (of course I would include both of the as religions anyway) and any of a variety of methods of research (Biblical/Historical Critcism would fit). I wonder if we don't need a narrower definition. Dennett's definition is for a reason. He is talking about the need to come to a theory about the evolution of religion. From burying the dead, to ancestors, to folk religions, to gods, and God and institutions and so forth. I doubt 'atheism' fits the Webster definition as it is at most one belief not a system. There are atheistic systems though their diversity can be huge. And some systems don't care (a fair number of UUs in good standing are atheists). The postulation of invisible, undetectable effects that (unlike atoms and germs) are systematically immune to confirmation or disconfirmation is so common in religions that such effects are sometimes taken as definitive. This is one of my complaints about intercessory prayer. People pray for someone to get better, they get better, and someone says "See! Prayer works!" The reality is, we can't observe what happens at the molecular level inside the body, and so that is where the miracles take place. No one ever talks about miracles in the sense of big production events with thunder and lightning from the sky--those would be observable events. So the miraculous becomes confined to the unobservable. That being said, that doesn't really have anything to do with religion per se--if I don't believe in intercessory prayer, that doesn't mean that I am religious. To me it makes more sense to talk about the divine not in terms of undetectable effects but rather in the overriding principles that undergird the phenomenon that we observe--which is to say, things like creativity or love. I think if prayer works its effects will be be measurable. If it has effects in the natural world it is subject to natural evaluation. Thinking about divine interventions, Marcus Borg said something at a recent lecture I attended. He asked us if we could think of any example in which "God punished someone." My answer was of course no. He didn't (and he could have) asked if we could think of an example where God rewarded someone. The punishment example was a little more direct way of making his point. The point he was making (I think) is that anything that might happen whether we perceive it as good or bad is the result of living in the universe. I wonder if we might make more ground if we asked how prayer evolved. Dennett talks about the human capacity to project intention on inanimate objects or imaginary creatures (ancestors/gods) etc. We have been engaged in prayer-like activities for some time. It is like talking to our car as if it is a person when we are trying to get it to work. This moves along to divination and healing rituals leading to folk religion then reflective activity leads to more complex religions. Ah, prayer. There have been studies done about prayer in recent years that have conflicting results. Some show that prayer doesn't make any difference. One, (and I will post a link if I can find it) found that prayer, when directed at sick or otherwise distressed people has a positive impact as long as that person knows others are praying for their wellbeing. This leads me back to a comment I made on an earlier post about the value of empathy as making connections, and how I feel that these connections might actually be God working in us (the only way I can accept the existence of God). Prayer, when simply praying for the well-being of others, seems like a very good way for God to move from one person out to the world. Praying that my job interview goes well, or that the printed matter changes order on the cards my husband is about to deal me so I get a Full House is merely wishful thinking. It also illustrates what I find odious about the way many religious people have made the concept of God into a personal assistant. Are you perhaps thinking of the study that found a slight increase in complications if people knew they were being prayed for? However unless repeated it could be a statistical fluke.